Select Roach - Time For Annihilation..On the Record, and On The Road PU-New, Punched upc. BNFS-Brand new factory sealed. 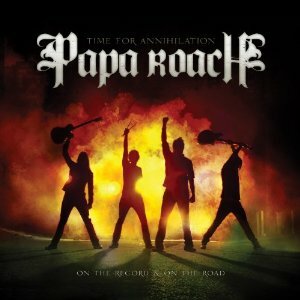 Time For Annihilation is a unique hybrid listening experience which will consist of a mix of new studio and live tracks. The band has enlisted veteran hit-maker David Bendeth to produce 5 new tracks and meld them seamlessly into Live versions of the biggest hits and fan favorites.